Artissima is held at the Oval, an architecturally innovative pavilion with 20,000 m² of naturally lit space made for the Winter Olympic Games of Turin 2006. Smaller than both London’s Frieze and Paris’s Fiac, Turin-based international contemporary art fair, Artissima, takes place from 7-9 November. Hosting a wide range of media, the venue is quite industrial, flooded with natural light, has ample corridor space and plenty of sitting areas for visitors to relax in and engage with the works on display. Visitors are allowed to brings their dogs to the fair. Scratches on the walls and floor fall into the experimental spirit of the fair and add to the art experience. Also, as a dog owner, I notice that dogs of all sizes are allowed in, which helps create a rather relaxed atmosphere rather than a strictly commercial one. 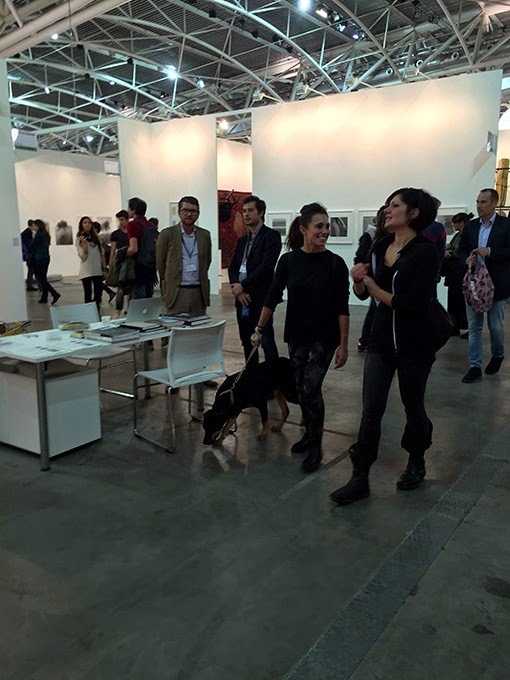 The gallerists are very friendly and eager to talk to visitors, even those who are not interested in purchasing art. There are many international galleries and prices range from a thousand to hundreds of thousands of euros. Milanese Prometeogallery presents Hiwa K’s installation My Father’s colour phases, which draws inspiration from K’s pre colour TV childhood whereby the artist’s father attached colourful squares to a television screen. In this case, K uses thin cellophane sheets. This childhood memory is priced at €45,000. 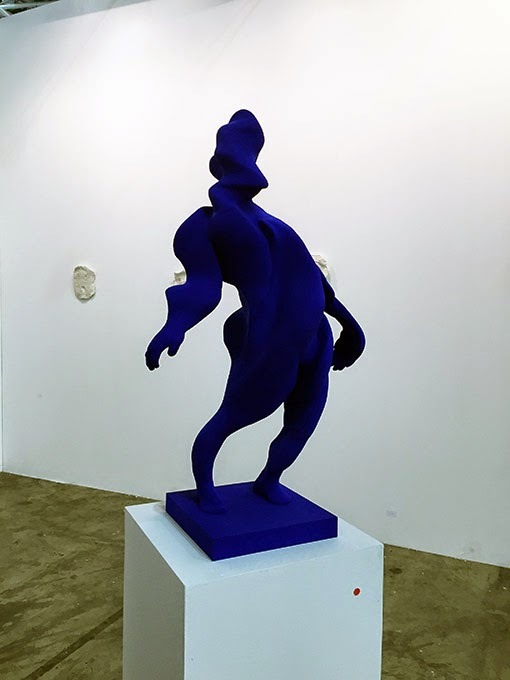 Among works of the Parisian Galerie Balice Hertling, Jon Rafman’s blue-tinged sculpture introduces a rather cutting-edge twist to modern sculpture. Rafman often uses photopolymer and metallic pigments. Made with a 3D printer, the piece sold for €18,000. Turin-based Galleria Alberto Peola displays three works by artist duo Botto and Bruno. 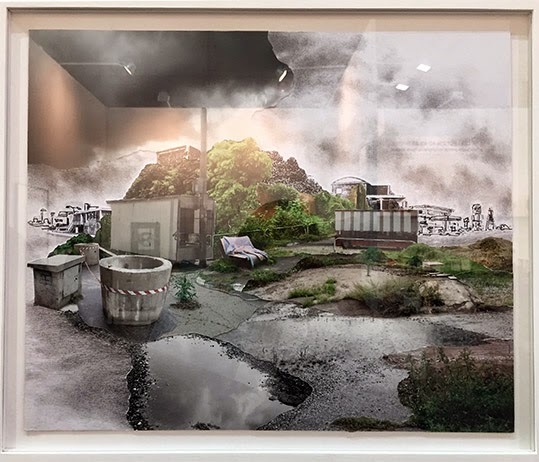 Depicting a soulless industrial city lacking human presence, the collages incorporate ink and pencil in addition to photography. Each piece can be purchased for around €5,000. 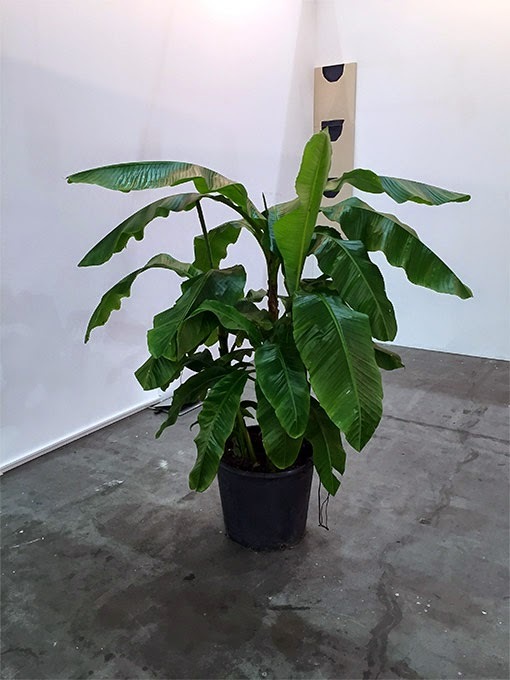 Galleria Paola Verrengia from Salerno, presents a solo exhibition of Arte Povera artist Luigi Mainolfi, who uses simple materials that can be traced back to nature. 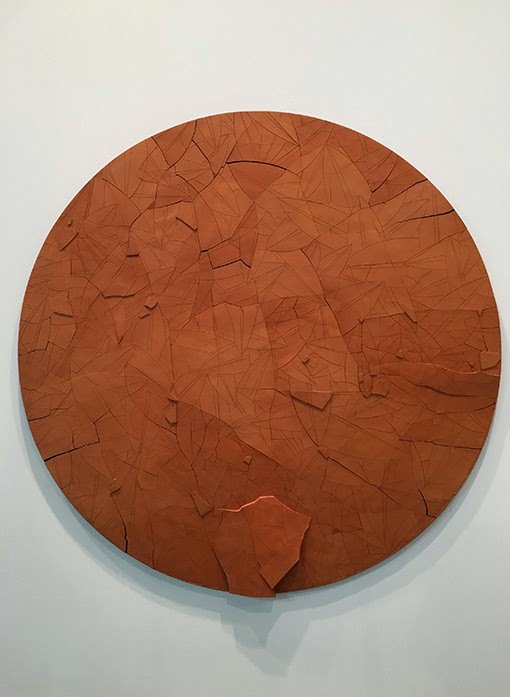 This 160cm in diameter Tobacco Tondo is made of terracotta and its patterns are similar to those found in tobacco leaves. The price for it is not so “povera” – €60,000. Car Drde presents local artist Angiola Gatti, who describes her pen on paper work Untitled as “a tension between clarity and profusion.” This large-scale piece is selling for €9,000. Bucharest's Kilobase presents Buy me a Mystery, an installation made of neon, fur and a bed headboard by Apparatus 22. The work reflects upon consumerism - the idea that when everything is had and there is nothing more to own, a woman asks her lover to buy her a mystery. This particular mystery can be bought for €11,000. Venetian Galleria Upp offers a cucumber installation by Antoni Starczewski, first created in1973. 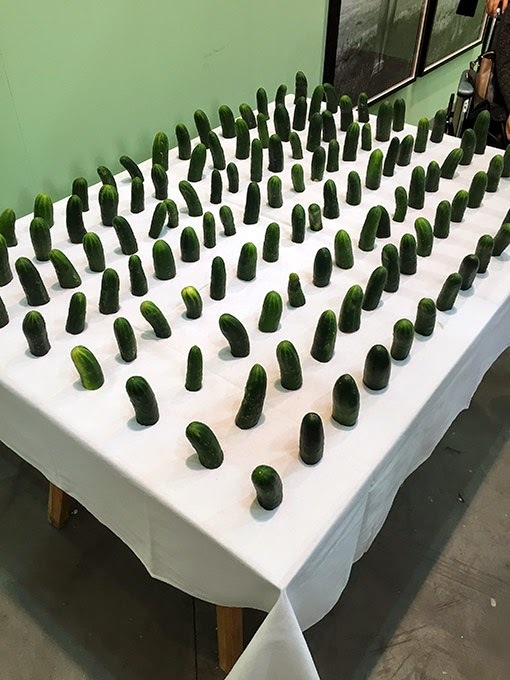 All cucumbers should be different and for €25,000 one acquires photographs of the original installation as well as a certificate allowing reproduction of the work. Three subsequent editions have made since Starczewski’s death. Mexican gallery Curro & Poncho presents the conceptual work of Juan Capistran. The artist attempts to show new ways to spread news - visitors are allowed to take a piece of paper, crumple it and throw it on the ground. This edition of three comes at a price of €8,000 and one can buy the certified PDF along with the right to print up to 2,000 copies. If one wants to loan it to a museum, all the copies must be destroyed before printing new ones. Not only galleries participate in the art fair, but foundations as well. The Fondazione Cassa di Rispario di Cuneo presents Michele Bruna’s Obitus. 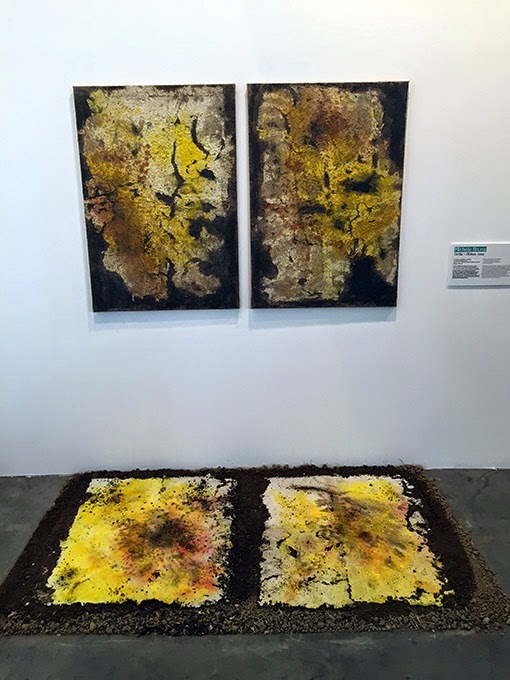 Bruna puts paper castings on the ground and then transfers them onto canvas. The soil used for the piece is not for sale yet serves to illustrate the process of creation. The canvases sell for €1,000. 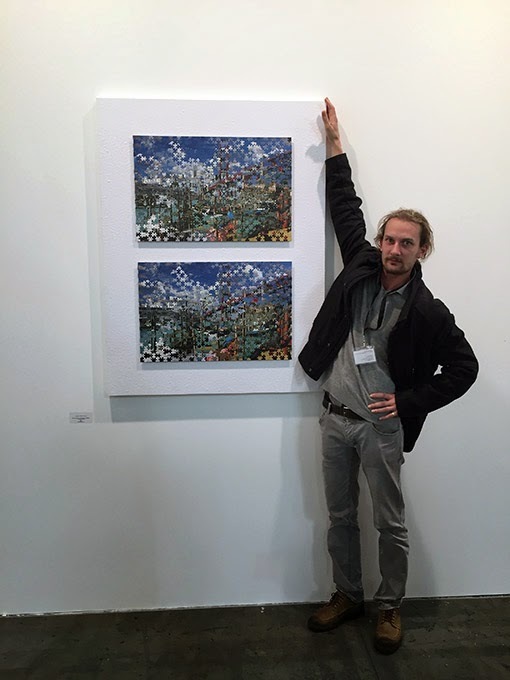 Amongst artists attending the fair are Verona-based gallery Artericambi's Christian Manuel Zanon’s, whose practice combines banal images as part of jigsaws, giving the works a new perspective. Zanon says that he deliberately pairs the works because from a distance, they appear the same, but are in fact different landscapes. He also states that "it's all a joke and I am trying to make sense of stupid images. It’s American and Italian landscapes crossing." Although Zanon claims not to be concerned about the price of his work, I was later informed by the gallerist that Zanon's piece costs €5,000. Tom Johnson, White-toothed Ambition: an Invitation to an Empire State. Lia Rumma. Enjoyable, relaxed and with a pleasant atmosphere, Artissima is also a place to innovate and experiment. There is a variety of media and a good mix of art to suit a wide range of budgets. As such, anyone can find something that appeals to them. Even though I found some works a bit too experimental, I was still interested in learning more about them.